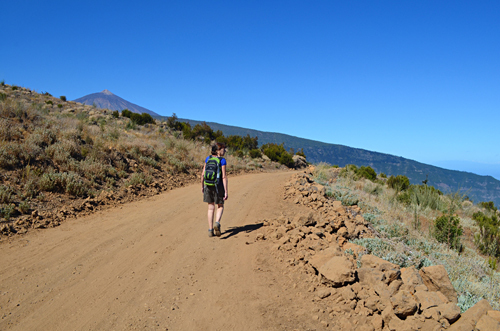 For most good walks on Tenerife you have to head into the countryside. 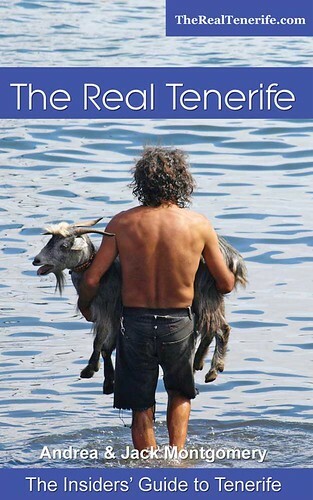 As a general rule, the best walking is found in the most remote corners of the island. But it’s not always the case. There are some decent walks where you can almost step straight from hotel and on to the route. 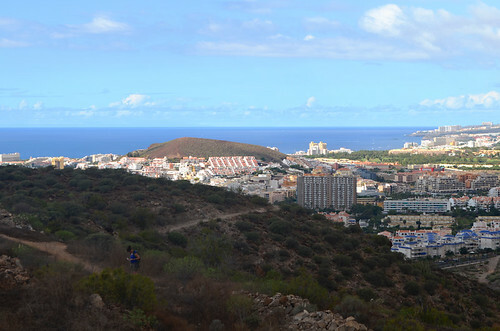 Montaña Guaza in Los Cristianos is like that. A path leads from one end of the resort up the slope of the volcanic cone and cliff that adds a dramatic bookend to the southern side of the resort. 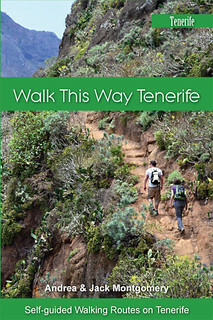 From the end of October conditions are generally good walking weather on Tenerife. Temperatures drop by a few degrees making it still good enough for sunbathing but not a killer for those who prefer more active pastimes. Even so, a thick covering of cloud was welcome as we walked up the hill to check our route directions for one of the walks in our The Old South set were still accurate. Initially the path was quite eroded, making the surface uneven. Usually this is a sign of the effects of rain. 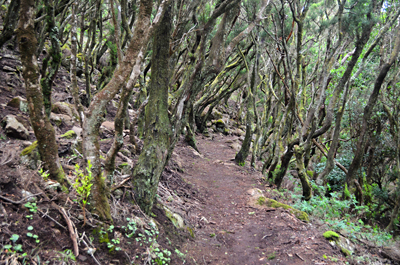 We enjoy the Montaña Guaza route, but it has one quite bizarre quality. We always pass people on the initial slope walking in either bikini top or bra. This never usually happens on routes away from the resorts, no matter how hot it is. 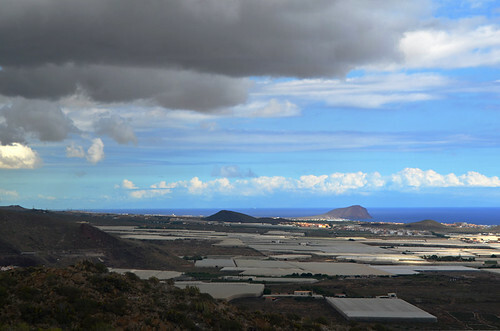 Although, saying that we encountered it on the Roque del Conde route the following day. There’s just something incongruous about passing someone walking in their underwear. 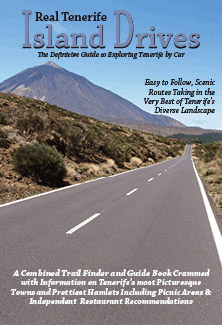 In theory the Guaza route should be a straightforward one – there’s the hill, walk to the top – but it isn’t as straightforward as it seems. The first time we did it, the directions we were using went AWOL as we reached the first plateau. Instead of one path we were faced with numerous ones. It was a bit like a maze without hedges. It took a few attempts and some ‘off path’ walking before we found the right way. The landscape isn’t particularly pretty but it is fascinating. The plateau was obviously once agricultural lands, now deserted. The most interesting aspect of the route are the views. The higher you climb, the better they get. 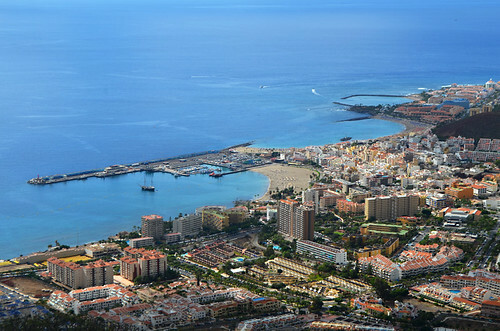 The southern coastline, then the south east coastline. 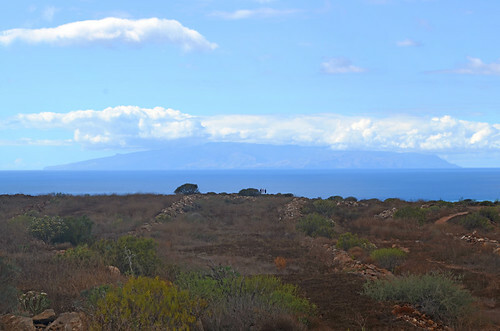 La Gomera and even glimpses of El Hierro, La Palma and Gran Canaria. As we climbed, the sky darkened. Rain had been forecast and sure enough it fell. Not enough to drench us, but enough to delay lunch of a couple of bocadillos from Sweet Eleven by about 40 mins. It looked far worse inland and up the hill where the cloud looked bruised and angry. 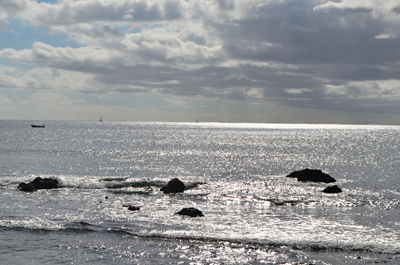 The coast revealed a mixed picture. Playa de las Américas remained in sunshine whilst Los Cristianos was affected by the same cloud that put a dampener on our lunch (a waitress told us later during our post-walk Dorada that rain had fallen in the resort as well). 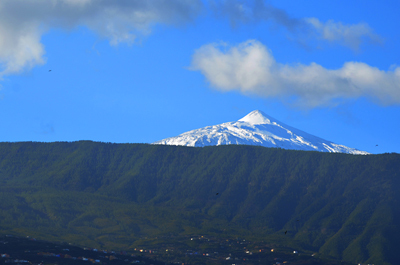 The best views of course are from the summit, where a 360 degree tour reveals a vista that includes a silver ocean, other islands, the southern resorts and an impressive landscape littered with volcanic cones. Normally at the end of summer, the terrain would be dry and brown. This year the slopes were tinged with green; quite unusual at the start of the winter months. The good thing about mountain walking like this is that once you’ve reached the summit there’s only one way to go – down. 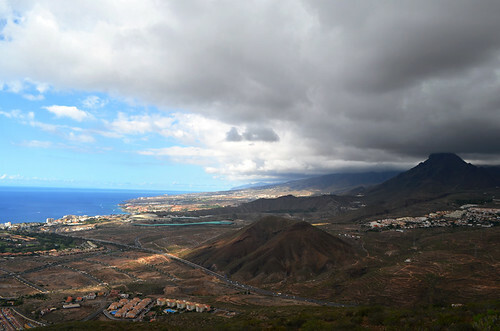 Despite the cloud and the fact we were descending it was still hot enough walking to bring on a sweat. Whether it was hot enough to justify stripping down to underwear is a matter of personal opinion… and taste.